Blogger Swap! … I really love this idea Dany of Nanys Klozet approached me with. Swapping outfits with fellow bloggers is so much fun! I've always thought that inspiration comes from everywhere not just celebrities or magazines. This is not the first time I take inspiration from her and funny how we have wore almost identical outfits without planning in the past. 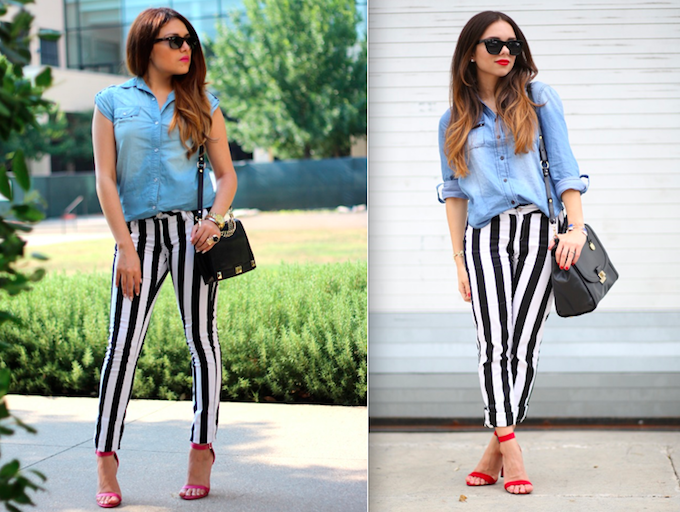 I had 2 looks in mind but I've been wanting to wear my striped jeans again so what better outfit to swap. I switched the red for pink and wore a short sleeve denim top. Blogger Swap with "Nanys Klozet"
LOVEEEE the pop of pink! You look gorgeous! this was so much fun! Lovely look, love your shoes! I do agree this idea was incredible. Great job with your look. Loved the swap! I loved this outfit when Dany first wore it and love it on you too! The pop of pink is such a fun flirty thing! I love the idea of blogger swap and this is one of my favorite looks! this sounds like a great idea! i love the pink! I think you both look amazing in these outfits! This kind of combo is something that I would love to copy as well! waau! you look so pretty!